We all have busy schedules so even cooking healthy at home can be a chore. It’s worth making the effort to eat the right foods that are rich in calcium, vitamin D, potassium and other nutrients to ensure that our bones will stay healthy and strong throughout our lifetime. What are those so-called ‘super foods’ that improve our bone health? We’ve provided a list of foods and examples for how you can add them to your diet. 1. 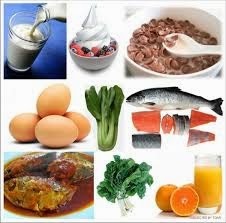 Dairy Products: Low-fat milk and cheese, as well as yogurt are an excellent source of calcium. So don’t forget to drink the milk when you finish your cereal or try dipping fruit into some yogurt for a quick and delicious dessert. 2. Fish: Sardines, Salmon, Tuna, and any other fatty fish contain vitamin D. Fish is easy to book -- Just throw it in the oven for a few minutes with some oil and seasoning and you’ve got a main dish in no time. 3. Fruits: Oranges, bananas and prunes all have potassium. So next time you need breakfast in a hurry why not make a quick shake? Add a banana, some strawberries and pineapple (which have vitamin C for bone health too! ), a splash of orange juice and a little yogurt to a blender and presto – you’ve got a yummy shake that provides tons of nutrients for your bones! 4: Vegetables: Dark leafy greens like collard greens, kale, mustard greens and turnip greens all have vitamin K. To get more of these in your diet, add kale instead of iceberg lettuce. Or you can sauté up any of these greens for a no-fuss side dish. 5. Fortified Foods: These are foods that don’t naturally contain calcium but that have been enhanced with different amounts of it. Orange juice is a great example. Just switch to a brand that has been fortified with calcium. It’s almost impossible to overhaul your diet overnight, but you can slowly incorporate these foods to help you improve your bone health. And maybe you’ll even discover a new favorite!